The Design Patterns for Inclusive Collaboration (DePIC) team has won the Award for Best Solution by a Large Organisation at the Connect Ability Challenge event, a software development competition focusing on developing technology that can help improve the lives of people living with physical, social, emotional and cognitive disabilities. 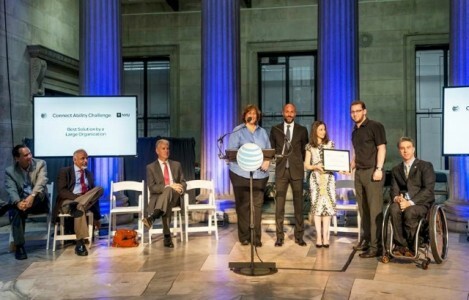 The event was organised by AT&T and New York University to celebrate the 25th anniversary of the Americans with Disabilities Act. The DePIC team, led by Dr Nick Bryan-Kinns, won the prize for their Accessible Peak Meter, which is an open source software that uses non-speech sounds in the form of sonification to allow visually-impaired and blind audio producers, musicians and sound engineers to gain access to digital audio workstations. The Accessible Peak Meter has been downloaded by over 80 users in the first three weeks of its release and is currently being used by audio producers and musicians in the UK as well as in the US. The tool was developed as part of the DePIC project, an Engineering and Physical Sciences Research Council funded project that investigates cross-modal and multimodal interaction techniques to support more inclusive interactions between sighted and visual impaired people. The DePIC team have also recently won the Best Paper Award at the 2015 International Conference on Auditory Display for their paper ‘Sonifications for Digital Audio Workstations: Reflections on a Particioaptory Design Approach’, which describes the process behind the development of the Accessible Peak Meter and other multimodal accessibility solutions that resulted from DePIC research including techniques for audio-haptic point estimation to support non-visual access to graphs. The DePIC project has also been recently featured in the latest issue of the CS4fn Magazine. Watch a video that describes the Accessible Peak Meter with sound examples and interviews with end users.